Attention to climate action has been high, especially two weeks ago when representatives from 175 countries signed the Paris Agreement, making it the most-signed international treaty in a single day. This week brings together another group of actors taking steps to curb climate change—those outside the UN climate negotiations. The Climate Action 2016 summit will be the largest gathering of a wide range of climate actors since COP21 in Paris last year. Featuring leaders from business and finance, cities, academia and other civil society organizations, this summit will draw attention to the diversity of non-state climate initiatives taking place around the globe. Of the 162 national climate plans, or intended nationally determined contributions (INDCs), submitted by countries to the UN Framework Convention on Climate Change (UNFCCC), 129 include plans to expand renewable energy. While countries may have independent targets, a number of cooperative initiatives can support them in meeting them. For example, Mission Innovation, launched in 2015, is the collaborative endeavor of 20 countries intent on accelerating clean energy innovation. Their commitment to double the amount of funding for clean energy research and development over five years could lead to a number of advancements to reduce greenhouse gas emissions. The Africa Renewable Energy Initiative is another new initiative that aims to build large-scale renewable energy installations in Africa. Others include RE100, a global initiatives of companies committed to 100% renewable energy, the International Solar Alliance, the SIDS Lighthouse Initiative and many more. The land sector is an important area for climate action since it produces roughly 25 percent of global emissions, and about 38 INDCs in forested developing countries include mitigation goals for forests in their INDCs. The Paris Agreement provides essential tools to help countries curb deforestation, but in addition, a number of cooperative initiatives will help. National and local governments, companies and civil society organizations continue to make commitments to the New York Declaration on Forests, a global initiative to cut forest loss in half by 2020 and completely by 2030. Regional restoration programs like Initiative 20x20 in Latin America and the Caribbean and AFR100 in Africa, both committed to restoring deforested and degraded land, are mutually supportive. 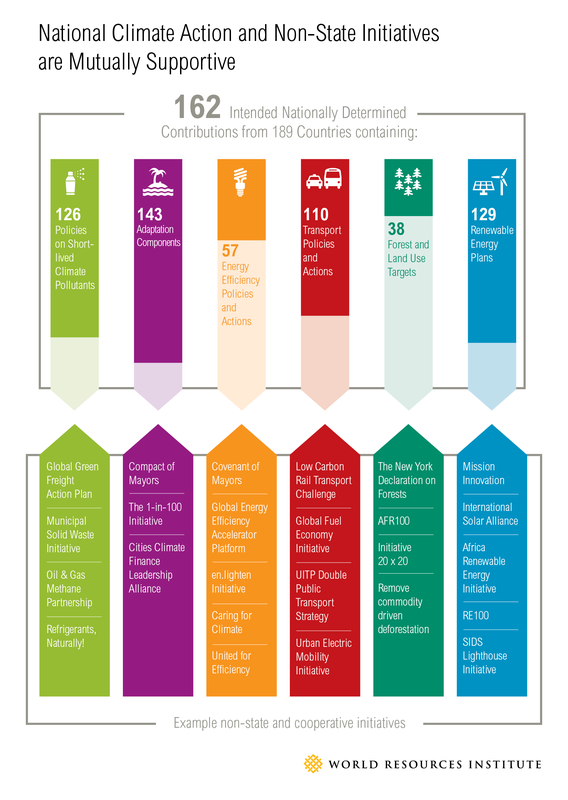 One hundred and ten countries included goals in their INDCs to reduce emissions from the transportation sector. Efforts like the Double Public Transport Strategy (PTx2) which aims to double the market share of public transport worldwide by 2035, and the Low Carbon Rail Transport Challenge, which set ambitious energy efficiency targets for 2030 and 2050 for the world railway sector, provide tangible steps for cities and countries. Others like the C40 Clean Bus Declaration, which could save up to 2.8 million tons of CO2 per year by introducing low and zero-emissions vehicles to bus fleets across 26 cities, are continuing to grow. Fifty-seven countries included building energy efficiency goals in their INDCs. The Energy Efficiency Accelerator Platform, established to help reach the UN Secretary General’s Sustainable Energy for All objective to double the global rate of improvement of energy efficiency by 2030, provides tools, expertise and support to address a number of energy challenges. Other initiatives can also help, such as the en.lighten initiative and the global fuel economy initiative. In addition to addressing carbon dioxide emissions, 126 INDCs aim to reduce at least one of the “short-lived climate gases” (methane, N20, HFC, PFC, SF6, NF3). Many of these gases are actually more potent greenhouse gases than carbon dioxide, but are not monitored as strictly. The United States and Canada have committed jointly to strengthen regulation of methane emissions. Company-led initiatives such as the Oil & Gas Methane partnership and Refrigerants, Naturally! will also play a role in reducing emissions from short-lived climate gases. The actions of governments and non-state actors are mutually reinforcing. When national governments set climate targets or adopt new policies, they send clear signals to non-state actors. When non-state actors launch cooperative climate initiatives and set individual targets, they help provide confidence that national governments will set and meet ambitious goals. The energy of non-state actors can be channeled into countries’ future commitments, or even provide insight for the review process to determine how countries are doing in fulfilling their INDCs. Moving forward, it will be important to continue providing opportunities like Climate Action 2016 for non-state actors to come together to advance climate action, share knowledge, gain recognition for their efforts and create new opportunities to build linkages to the implementation of countries’ NDCs. Climate change is a global problem. Solving it will require action from all levels of government, from every sector, and really, from everyone. Note: For the purposes of this blog, the term non-state initiatives refers to all activities to address climate change by cities, regions, businesses, international organizations and national governments.